Most of the time we carry way too much mtb gear. In reality, esp. during summer and fall in the Sierra, we really don’t need much more than water, repair kit, gels/bars, and maybe a very light wind layer. For longer rides you can usually get away with this tech as well, maybe more food and another layer, more water. Most of the existing bike packs out there are heavy on the overkill: helmet straps, room for two jackets, layers, three lunches, 4L of water, etc. Way, way too much weight. Keep it simple, ride lighter, faster, less encumbered. 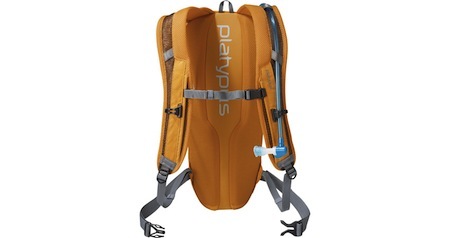 This summer I have been riding almost full-time with Platypus’ Tokul XC 3, a “minimalist” pack that does everything it needs to and nothing more, which is exactly what you want. 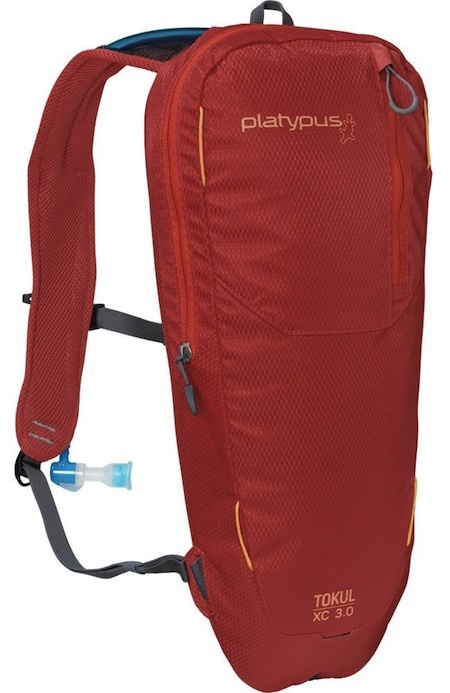 And if you’re more of the I don’t wear packs variety and use a Platypus’ .5 or 1L bottle, the Tokul is your next step up for longer rides. Stay focused, not burdened, check out the Tokul 3.0. The Tokul XC 3 is slim, fits down the center of your back, designed to carry 2L of water (2L Bigzip SL resevoir – best in the business – included) and 1L of gear. Granted, you really need to stuff your gear in there, and it takes a little bit of trial and error to dial down your system, but it does fit a lot, actually. 2L of water = about 3-4 hours of riding, depending, of course. The primary benefit of riding with a slimmed down pack is that you don’t feel it. Along with its size, the Tokul XC3 boasts a very nice shoulder strap and sternum strap, allowing you to cinch the system down very comfortably, really making it disappear as much as a pack can while riding – next best thing to riding without a pack! Seriously, the Tokul 3 does a great job of conforming, holding, and and hiding; you barely notice this pack on your back when riding. The back of the pack is designed to keep the majority of the pack off your back – there’s a channel that runs the length to enhance airflow and cooling. Chest straps a re setup to use water/hose on either side, though you may have to cut the hose to fit your preference. There’s a nice stash pocket on the outside, including a key loop, big enough to fit a map if need be, bars and gels, phone. Inside the main compartment, its mostly utilitarian space for the water reservoir, with room below and up top for a thin layer, pump (there is a pump sleeve but it’s not that handy nor sized that well). As with all Cascade Designs’ products, the quality of the stitching, fabric choices, strap details are excellent. This pack is very well made and will last a very long time. (I still have a Platypus bike pack from 1998! that works great). One thing that I would refine: there is a light loop at the top of the pack, designed to track your wiring to the center of your helmet, which is fine, but there should also be a larger sling/loop simply for hanging. There’s really no convenient stash loop for hanging your pack on its’ days off. It would also be nice to have the pack zipper go a full 180 degrees to facilitate packing a little more easily. Minor detail gripes. This pack is excellent, pretty much your go-to pack for 90% of all rides. The Tokul XC 3.0 is the go-to pack when all you need is hydration, fuel and tools. Its low-profile rides as cool as it looks, and the pared-down feature set will please anyone that believes less is more.